Sorry I’ve been a bit MIA recently! 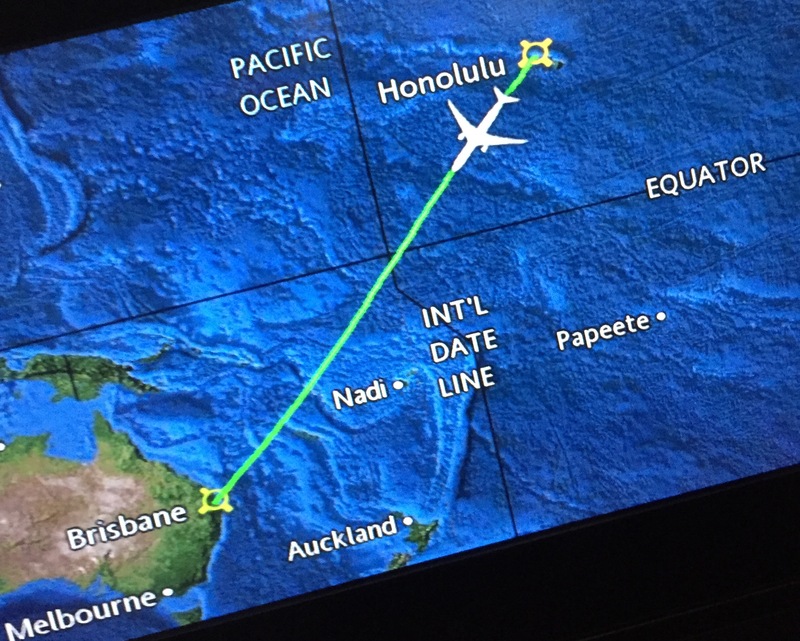 I’ve been busy settling into life in Australia and forgetting that the International Date Line exists. In total, my trip took about 30 hours from start to finish, and I think I slept about 5 hours altogether. Although I love flying and tend to find it relaxing, that much travel is pretty taxing. Below are a few things I did to keep myself looking and feeling human for those long hours. 1) Be prepared: I made sure that I had all my electronics charged (and a portable charger for my phone), but I also made sure I had ample non-electronic things to keep me occupied. I packed my larger carry on with spare clothes and everything I would need if my luggage got lost for a few days (which it thankfully didn’t). 2) Sanitize: I bring wet wipes with me and wipe down all hard surfaces when I get to my seat on a plane. Although I’m not normally a fan of hand sanitizer, I use it like it’s going out of style when I’m traveling. I also stay away from any water on the plane, since it’s teeming with bacteria (which means ordering drinks without ice). 3) Moisturize and Cleanse: I brought facial wipes and a travel sized tube of my favorite moisturizer. It really helped me feel better to be able to somewhat clean my face and keep it happy in the dry plane air. I tended to do a little cleanse and moisturize routine every six or so hours on each flight. 4) Hydrate: Not new info, but planes are dehydrating (hello, recycled air!). Even though it meant annoying my seatmates a bit with a few extra trips to the bathroom, I made sure to keep hydrated. I only drank (bottled!) water on the plane, and I accepted it every time it was offered. I also filled up my Camelbak water bottle at every airport and drank it on each flight. 5) Get Ready: On my last flight, about an hour before we landed, I cleansed and moisturized my face, and then put on a little bit of CC cream and some concealer. Even though it was 9:00pm Australia time and I only had the hour or so drive to my university left of my trip, it really helped me feel awake and human for the last leg (especially since it had been more than 30 hours since my last shower). 6) *Bonus* Starbucks: I found that getting Starbucks at each airport, although expensive, was a nice way to treat myself at each stop on my journey. Your treat might not be a green tea lemonade with light ice and no sweetener, but having something to keep up a positive attitude– whether it be a magazine, candy bar, or coffee– helps to keep the experience an enjoyable one. I hope this helped anyone who’s getting ready for a long flight! Of course sleeping as much as possible and eating healthy snacks (I brought homemade trail mix and Clif bars) also helps on long flights, but the above really made the difference in my trip. Anyone else have any go-to travel hacks? Ambien! Oh, and brush those teeth…nothing’s worse than 30 hours no brushing. Now post some pictures of your room mate! That’s another good tip I forgot to add! I brought a little travel-sized toothbrush set with me as well on the trip and it was a lifesaver! Thanks, Kathleen! I can’t wait to see a post about your new apartment!! These are all great!!! I go to school abroad so flights are quite the norm for me. 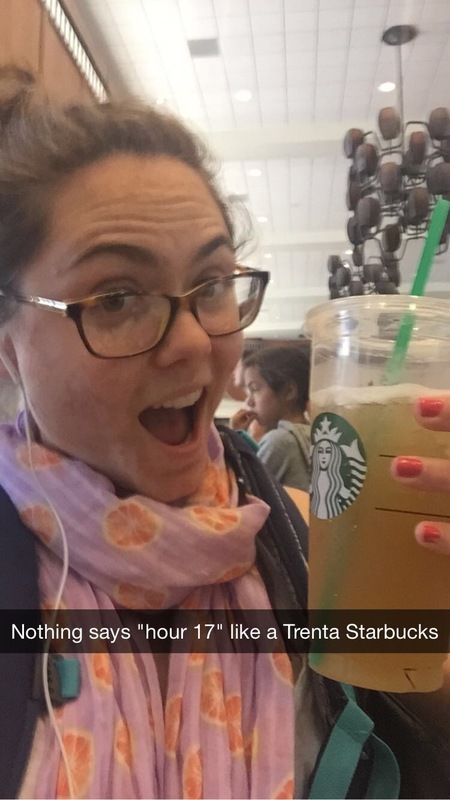 I swear by hydration (and starbucks, A+ snapchat haha).